Another day, another disaster for Carmelo Garcia as his dirty secret taping of a lunch with former State Senator Bernard Kenny and the mayor's husband, Stan Grossbard exposes the underbelly how he conducts HHA business. This time it's a discussion surrounding the attempt to appoint a Carmelo Garcia choice for auditor. Charles Daglian is part of the discussion in what Garcia calls an "unexpected" 3-3 vote. As anyone knows on a government board or not, a 3-3 vote does not constitute a majority and so the item in question doesn't pass. But as Carmelo Garcia wanted to pass his choice for auditor, HHA counsel Charles Daglian claims he doesn't know what the 3-3 vote means and that he will need to research it further. This of course was done to please Carmelo Garcia and was not pleasing to the HHA board who see what's going on. Months later, HHA commissioner Jake Stuiver would cite Daglian's actions as giving the board no confidence to see him continue under any circumstance. Both Garcia and Daglian have predicted a sixth vote on renewing his contract in a story on Hoboken Patch last June and highlighted in the Hudson County TV video. Early this year one vote was dismissed by HUD in what it described as "legally flawed." Daglian sat on the dais of the meeting working with Garcia to see his own contract renewed. 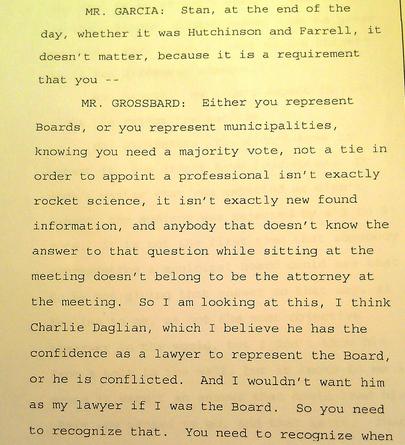 In one portion, Garcia attempts to smooth over why the failed resolution for the auditor needs more review but is "schooled" by Grossbard who explains what the failure means to both the resolution and HHA counsel Charles Daglian and how his action would lose confidence to keep him on as the HHA attorney. HHA counsel Charles Daglian who doesn't know the obvious meaning for the resolution and himself. At the most recent vote on the HHA legal counsel contract last month, Garcia brought it back without the bidding process and after the vote attempted to say HHA commissioner Judy Burrell had voted by phone in favor of Daglian (transcribed in the minutes) but MSV later produced its incontrovertible video, Burrell had voted "no" on Daglian. HHA commissioner Jake Stuiver also described the entire vote as illegal after Daglian again failed to be re-appointed. It's apparently a culture of corruption ingrained in every repeated misstep along the way.